After nine races, Brazil’s Mauricio Santa Cruz and his team aboard Bruschetta edged out the competition to win the 2011 U.S. National Championship by one point. Hosted by the Dallas Corinthian Yacht Club, the regatta featured great wind and even better Texas hospitality. 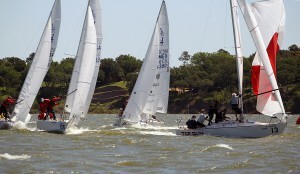 Second place went former U.S. champion and perennial Texas Circuit champion, Bob Harden, followed closely by Chris Snow of San Diego, California. 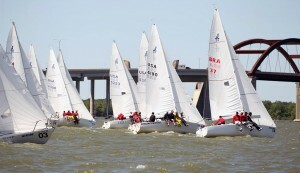 Conditions were ideal for racing with 10 knot south winds on day one, changing to 20 knot north breezes on days two and three. Off the water, sailors were treated to great food and fun highlighted by the hotly contested J/24 game night. Contests included a genoa sheet bull roping contest and the bowman olympics. Special thanks go to the title sponsor, Layline, and to the local organizers Kelly Holmes and Tonja Sanchez who put on a fantastic event.